Hwy 3 – Can’t miss it. 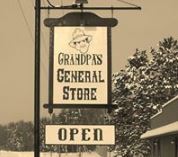 Grandpa’s General store is located 5 ½ miles north of Merrifield on County Road 3 & south of Crosslake 9 ½ miles. For store hours please see our Facebook page.